Rutland and Owens will spend seven-and-a-half months in the saddle ahead of the Rugby World Cup. South African Rutland is no stranger to long-distance adventures. Before the 2015 World Cup he embarked on a two-year, 42,000km cycle through Africa and Europe, arriving in England for the Springboks’ first game against Japan -- which, famously, they lost. “To be honest at the end of that I was pretty broken physically,” says Rutland. “I had a hip replacement in the past year and I thought I was over it all -- I had had these two big adventures and maybe thought it was time to settle down and get a real job. And so the Race to Rugby World Cup 2019 was born. Rutland and Owens, a Briton born and raised in Hong Kong, are undertaking the seven-and-a-half month journey to raise money for ChildFund Pass It Back, a sports development program and the official charity of the World Cup. Aside from sub-zero temperatures and frozen roads, the riders passed through Europe relatively unscathed. Temperatures will rise as they approach Japan via Turkey, Iran, Turkmenistan, Uzbekistan, Tajikistan, China, Pakistan, India, Nepal, Myanmar, Thailand, Laos, Vietnam, and Hong Kong. The pair are endeavoring to stick to their pre-planned route, but acknowledge that circumstances may force them to make diversions. Rutland is aware, for example, of the conflict in northern India close to where the current route takes them. “Other than the English Channel and the sea between Shanghai and Osaka, we are determined to cycle every inch -- but not at the expense of doing anything reckless and stupid,” he says. The south-Asian stretch will also throw up some of the most eye-catching parts of the journey. 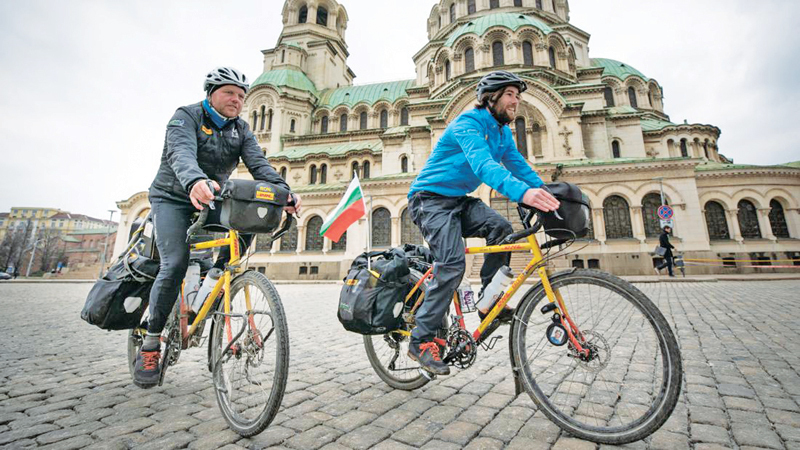 The Pamir Highway will take the riders through Tajikistan and into the Himalayas, a route that’s long been on Rutland’s bucket list. Then there’s the Karakoram Highway, the iconic road that meanders from China down into Pakistan. The two riders have plenty to negotiate before they can even start contemplating rugby and the World Cup, but Rutland says that he has earmarked a few games he hopes to watch -- and is optimistic about the chances of his native South Africa.